Recording software - what is it? Recording software, also commonly referred to as Video Management Software (VMS), is software for installation on a PC or server, which enables you to manage IP cameras using your existing network and computers. 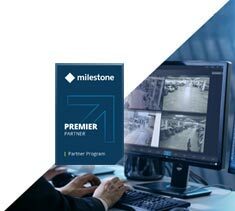 Milestone XProtect is the world-leader in video management software and is our best-selling solution for IP camera recording and video management. Being 'Open Platform', Milestone software is compatible with hundreds of different IP cameras and video encoders. The VMS is feature-packed and easily scalable, making it a popular choice for organisations of all sizes. Axis Camera Station is optimised for use with a wide range of Axis network products including IP cameras, access control and other accessories such as speakers. These devices can be easily integrated and managed using a desktop client or mobile app, making this VMS a versatile choice for small to medium sized organisations. In addition to supply, we provide free helpdesk support if you need help installing, configuring or using the software. We also offer on-site installation, commissioning and training to ensure your IP video system is set up correctly and optimised to your requirements. Affordable, user-friendly video recording software for up to 48 channels (device licence required for each camera). Supports Axis, Sony, Panasonic, Bosch, Samsung Wisenet and more. Mobile access via Android, iPhone and iPad. Core licence for integration of a single Axis IP device. Scalable CCTV surveillance for medium-sized organisations.